The Chino, CA school board has rejected a proposal crafted by Alliance Defending Freedom, an anti-LGBT hate group. What ADF really protects is the vagaries of conservative Christians who seek the “freedom” to discriminate. For several years now, Alliance Defending Freedom, has created the boilerplate for adoption by school boards. These things are given deceptive names and then promoted by local conservative Christian organizations. In this case ADF's scheme is titled: Model Parental Rights in Child’s Education Policy. The group lobbying for adoption of this scheme is Capitol Resource Institute, located in Citrus Heights, CA (Sacramento metro) and run by Karen England. Its annual budget is about $130,000. Ms. England's greatest difficulty appears to be telling the truth. The real agenda is to undermine California's Healthy Youth Act which became law in 2016. According to the law, students must receive information about sexual orientation and gender identity. You would think that kids were being covertly implanted with chips that (depending upon random sample) would turn them L, G, B, T or Q. Quoted portions of the boilerplate are styled like this text. According to ADF's blueprint, all parents would have to be notified if any transgender student was accommodated. This is worded as “physical privacy concerns.” So-called privacy is nothing more than a proxy for acting on religious conservative disapproval of transgender children. That disapproval is not based on anything more than faith in ancient texts. It sure as hell is not based on medical science. According to the model policy, parents could opt their children out of any instruction that involves gender, gender identity, gender expression, sexual orientation, discrimination, harassment, bullying, relationships or family. Students can also be opted out of any instruction regarding HIV prevention. FAMILY LIFE EDUCATION means instruction, materials, presentations, or programming that discuss gender, gender identity, gender expression, sexual orientation, harassment, bullying, intimidation, relationships, or family. The above could apply to social studies, history and maybe English depending upon the texts being used. The school shall be responsible for ensuring that every parent or guardian receives all written notices. Any failure to properly notify a parent or guardian that results in a child receiving comprehensive sexual health education, HIV prevention education, or family life education against the wishes of the parent or being exposed to a physical privacy concern against the wishes of the parent shall be considered the fault of the school. The school shall be responsible for removing a parent’s or guardian’s child at the proper times according to the parent’s or guardian’s opt-out request as indicated in the signed statement from the parent or guardian. What this does is to change opt-out to opt-in as the only way to legally protect the school. It also means that the school has to employ staff just to go around to collect the kids who have not opted in to various instruction and then put them somewhere else where additional staff will have to do something with them. In the end this all amounts to conservative Christian Privilege. They are inventing a right to essentially control the schools that their kids attend. Most Christians want their children to receive this kind of information so a tiny fraction of remaining parents would be in charge. 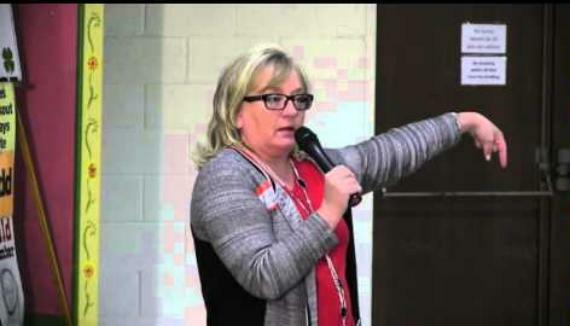 Throughout this process, Karen England claimed that the schools were using “X-rated curriculum material” for instruction. She spread a considerable amount of misinformation to the community which included the notion that the mere presence of LGBT people or information posed a threat to children. Ms. England will say anything to advance her agenda. We know about events in Chino. How about hundreds of school boards around the country that ADF has infiltrated? Some members of those school boards are there because Christian Nationalists, like David Lane, promoted their election.